In conserving the heritage of Asia and the Pacific, UNESCO seeks to encourage the role of the private sector and local communities in preserving their cultural heritage. The UNESCO Asia-Pacific Awards for Cultural Heritage Conservation were established in 2000 to recognize and encourage private efforts and public-private initiatives in successfully restoring structures of heritage value in the region. The deadline for receipt of materials is 31 March 2016. Since 2000, UNESCO has received 598 entries from 25 countries, spanning a wide range of conservation projects from family homes to palace complexes. 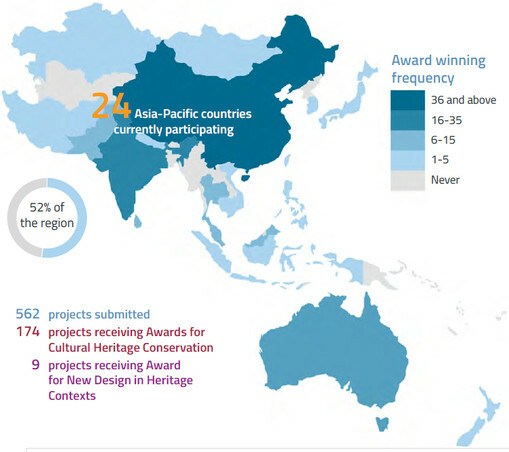 A total of 185 projects have received UNESCO Heritage awards for conservation. In addition, 10 projects have been honored with the Award for New Design in Heritage Contexts, which recognizes contemporary architectural design in a heritage context. The winning projects have set high technical and social standards for conservation in the region. They have increased local preservation efforts, inspiring local communities to take action to save their historic buildings. Award of Excellence is the highest recognition presented to the projects that display exceptional achievement in all criteria and has major catalytic impact at the national or regional level. 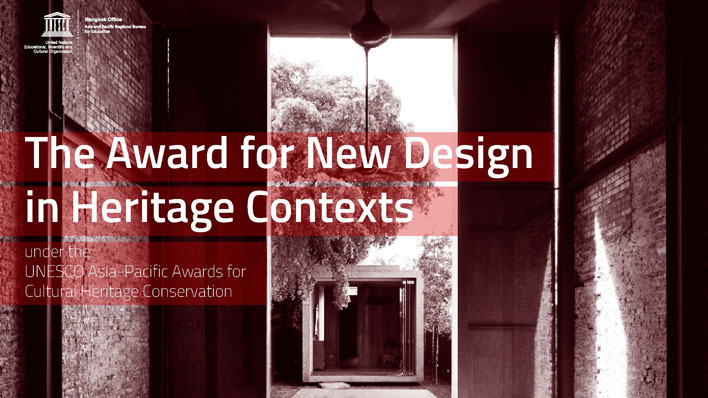 The Award for New Design in Heritage Contexts. Previously known as the Jury Commendation for Innovation, this special award was established in 2005 and is given in addition to the conservation award categories. It recognizes newly built structures that demonstrate outstanding design well-integrated into historic contexts. Submissions of completed new architecture and design projects that enrich the heritage setting are encouraged as a part of the contribution to the future of sustainable heritage safeguarding.